In my youth I worked in many restaurants and in the process, I ate a lot of restaurant food. I can’t tell you just how many BAD Caesar salads I’ve eaten in my day, but there were a lot. And it certainly wasn’t easy to find a good one. Then everything changed when my little brother got a job working at a now defunct restaurant called Clancy’s, in Winnipeg in the early 1990’s. That was how we discovered this amazing Caesar salad dressing recipe! However, my very first job was a “salad girl” at Bonanza. I was 14 years old. I recall my parents having to sign some special form to say I could work; I had begged them. I wanted to have my own money and a real job so badly; not just the chump change I was earning from babysitting at the time. Surprisingly, for a restaurant that had the biggest salad bar around at the time, (so big that they needed 2 ‘salad girls’ stocking it during the dinner shift) Bonanza had one of the worst Caesar salads I ever tasted! But they did have an amazing Monterey Chicken. There are very few restaurant recipes that I want to recreate, but that chicken is definitely one of them! So, I am on a mission to recreate it. I actually contacted a couple of people who worked there with me back in the 80’s, but even based on their memories, I haven’t been able to get it right. So, I’ll will keep plugging away at it…. But this Caesar salad dressing… Oh man, I’m soo lucky that I don’t even have to try to recreate it because my brother got the actual recipe many years ago. It’s no copy cat -it’s the real deal! It is tangy, creamy and oh so delicious! My Mom started making this salad dressing back then and it has become a cherished family classic. 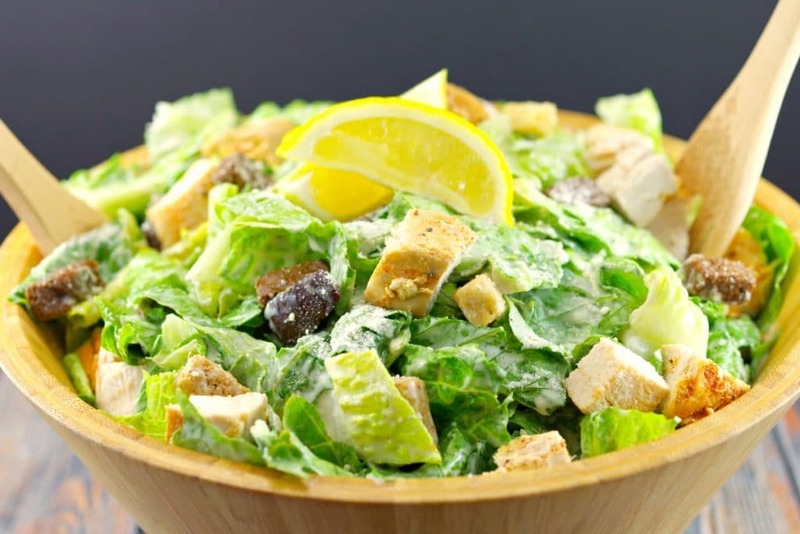 If this Caesar salad is not served at a special meal or gathering in our family, it is very unusual. I moved away from Winnipeg many years ago, but I still serve this salad at every special meal I make. And whenever I bring it to a dinner or potluck I always get asked for the recipe. When I took that job at Bonanza at the age of 14 my parents told me I’d have plenty of time to work and instead, I should just enjoy being a kid. I wish I listened to them because I’ve been working ever since. And by the age of 30 I was pretty much ready to retire. Several years later, I am still ready to retire, but that won’t be for a while yet. Fortunately, I’m not working in the restaurant business, as I had my fill of that for a lifetime. And although my parents were right, one thing I have no regrets over is being introduced to Bonanza’s Chicken Monterey. But I’m especially thankful that my brother did his own stint in restaurants and was able to score this amazing Caesar salad dressing recipe! 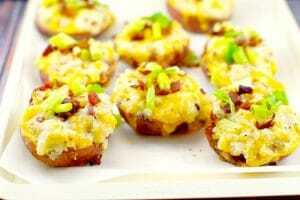 I always end up with a little extra dressing (or make sure I do now that I created these) So if you have leftover Caesar salad dressing, then give these Caesar Twice Baked Potatoes a try! They are soooo tasty! 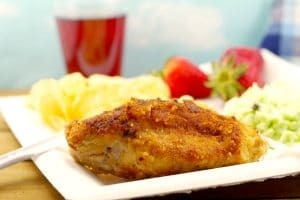 I loved this Caesar salad dressing recipe so much that it inspired me to create this Fried Caesar Chicken! 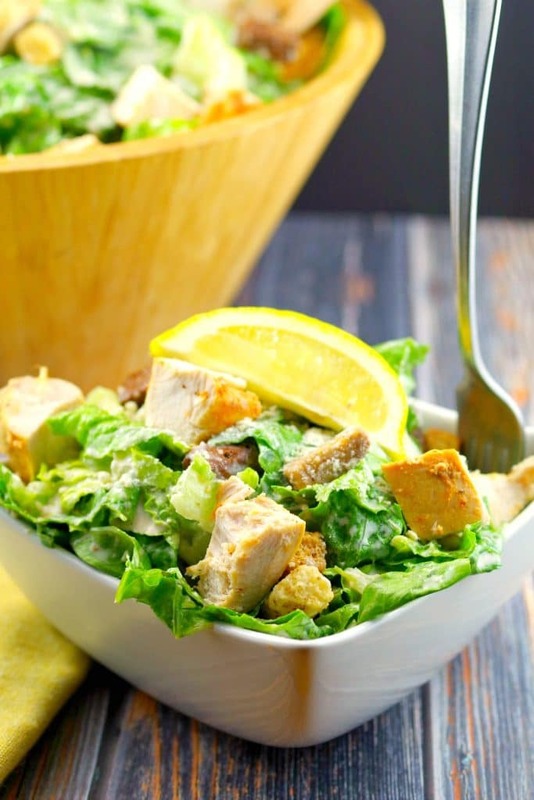 This Grilled Chicken Caesar salad boasts the best Caesar salad dressing ever! And anyone that has tried it agrees. 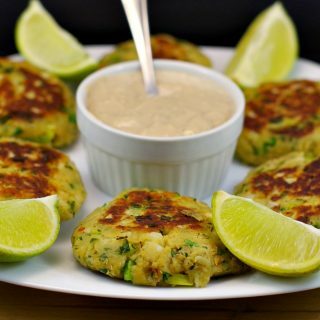 This recipe came from a restaurant (Clancy's) that no longer exists, but it has become a family favorite and always requested at dinners and potlucks! Wash and cut lettuce into bite sized pieces. Add croutons, parmeasan cheese and cooked chicken. *This recipe uses raw eggs. Previous Post: « Birthday Cake Batter and Ice Cream Crepes: Birthday Breakfast! I had forgotten all about Bonanza restaurants! We used to take our kids to the one in Victoria years ago. Some of the salad bar items were good, others not so much! 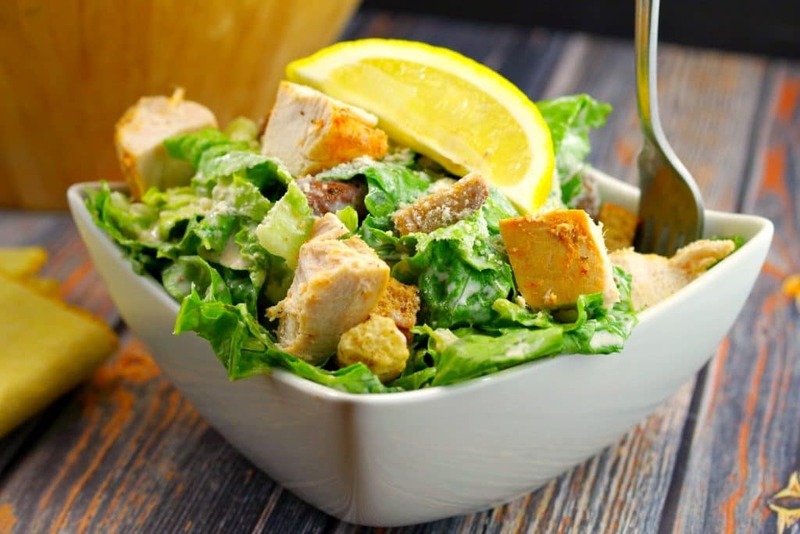 Caesar Salad is my hubby’s favourite and you’ve paired it with Cajun chicken which I love! Great classic recipe Terri! I need this in my life! Your dressing definitely sounds like a keeper. So many restaurants have lousy caesar salads, I usually just make it at home. Next time I make it I’m trying out your recipe. Thanks for sharing! Hi Jo- Thanks! Yes, it soo hard to get a decent caesar salad in a restaurant. I hope you enjoy the recipe! You’re so right, there are a lot of bad Caesar salad dressings out there. Yours looks closer to the classic, which is always delicious. Bonanza restaurants! I forgot about them, too. Thank you for this great restaurant recipe, Terri! I am quite familiar with them and this one sounds like a keeper for sure! 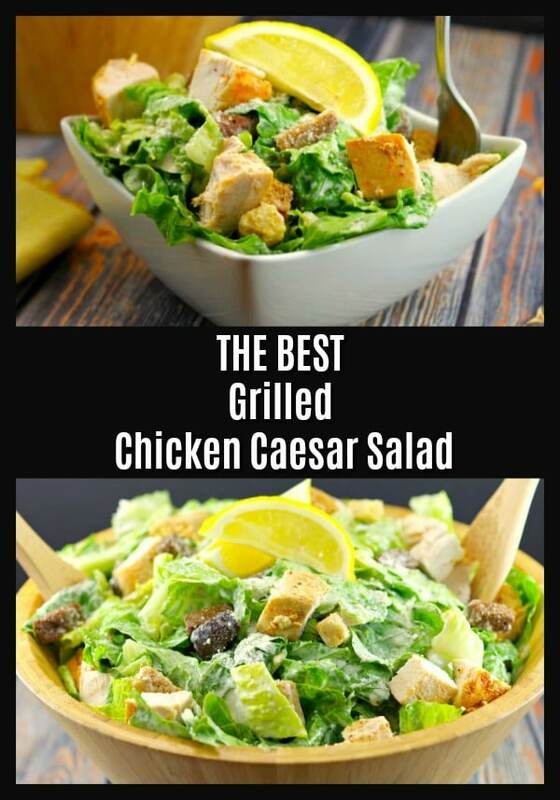 Chicken Caesars Salads are a favourite in our house. Thanks so much for sharing! Thanks, Denise! Not many people remember Clancy’s, so it’s nice to hear you do :).